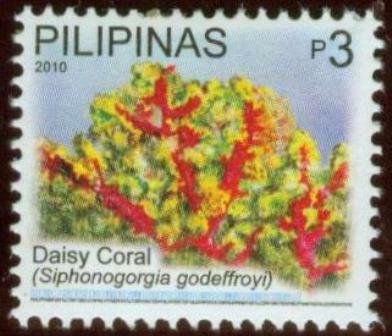 3p Daisy Coral (Siphonogorgia) is a Indopacific coral genus of the subclass Octocorallia. 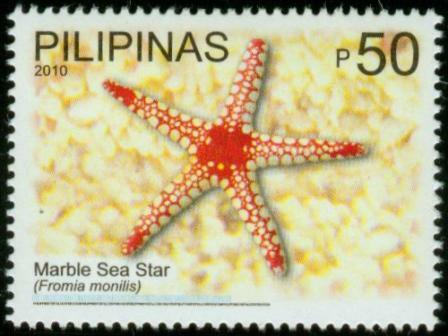 We find the coral in the tropical western Pacific in the Philippines and Malaysia and the Red Sea. Siphonogorgia colonies are similar with their slim, richly branched growth of a gorgonian have, however, with no rigid axial skeleton, but are stabilized by the internal water pressure. Main trunk and large branches are without polyps. As with all Octocorallia, they have Siphonogorgia polyps eight tentacles. The polyps can be completely withdrawn into the branches. The branches are densely equipped with spindle-shaped sclerites, so they feel drawn together. Siphonogorgia are usually splendid yellow, red or purple colored. The color of the polyps is often different from that of the branches. 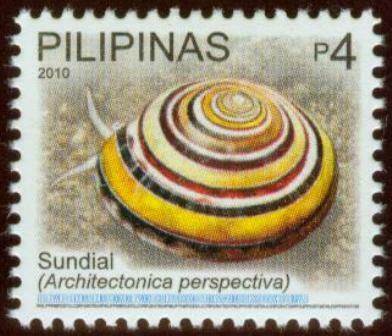 4p Sundial (Architectonica perspectiva), common name the clear or perspective sundial shell, is a species of sea snail, a marine gastropod mollusk in the family Architectonicidae, which are known as the staircase shells or sundials. It is considered moderately common and usually found subtidally on sandy and muddy bottoms, from depths of 10 to 120m, mostly between 10 and 65m. An unmistakable snail, the shell coils form a flat disc-shape with a flat base. The shell is beautifully banded in shades of black and brown. The body is striped too, to match the shell. The operculum is made of a horn-like material. 50p The Marble Sea Star (Fromia monillis), or Marble Starfish, is one of the more common of the Fromia species, its coloration making it one of the more striking of all the sea stars. Its central disc will have an orange to deep red color, while its arms have cream-colored spots with a red edging. It is found over sandy substrates, on rocks, and sometimes climbing on anemones. It is constantly foraging for micro-organisms and detritus to eat, so the aquarium should have ample amounts of live rock. It generally lives alone, but if the aquarium is large enough to support more than one, it will tolerate others of its own species.